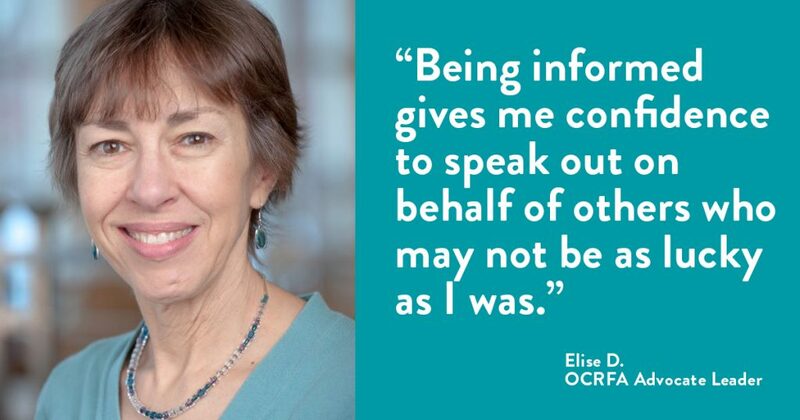 Elise feels lucky that she was diagnosed with early-stage ovarian cancer, and being an Advocate Leader allows her to fight for women who may not be able to fight for themselves. Tell us about your ovarian cancer journey. In the summer of 2005, I was an active, busy 49-year-old mother of two. I liked to run, play tennis, and hike, so I was in good physical condition. The first clue that something was wrong was when I noticed I wasn’t hungry, and I felt a bit bloated and sluggish. While that may not have been a sign for most people, I had a history of ovarian cysts and ever since, have been hyper alert. I saw my doctor, who took one look at my extended stomach and knew there was a problem. My doctor immediately did a transvaginal ultrasound, and upon seeing the results, referred me to major medical center in Boston. Once there, the gynecologic oncologist performed a CT scan –they found a tumor the size of a grapefruit. When they told me I most likely had ovarian cancer, my whole world went dark. 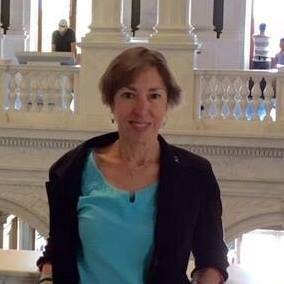 When I was able to think straight again, I decided to get a second opinion from Dana Farber Cancer Institute. The doctor there agreed with the original diagnosis, and surgery was scheduled. My family knew about ovarian cancer, as my husband’s mother and her sister died from the disease in the 1970’s. Although we had more awareness of the disease than most families do, I never thought it would happen to me. It was my husband’s family that was affected, not mine. And my poor husband was told his wife had the same disease that took his mother’s life. My kids were about to start their own independent lives, and were afraid to go too far from home. It was a tough time for all of us. When I finally went in for surgery, the diagnosis was ovarian clear cell carcinoma. The good news is that I was diagnosed in early stage (1a), so cancer was contained. But because of the clear cell variety, I had to get treatment as well as surgery. I had five rounds of chemo, and, thankfully, haven’t had any recurrences since then. You’re an OCRA Advocate Leader. How long have you been an Advocate Leader? I’ve been part of the program since its inception. I went to my first annual conference in 2006. As a huge gatherer of information–I’m a librarian–I wanted to learn as much as possible, and I was able to do that through the conference and OCRA’s other programs. What made you decide to become an Advocate Leader? I joined an online support group, and that’s how I learned OCRA was looking for Advocate Leaders. I consider myself lucky that I was diagnosed at early stage, and I appreciate that every day. I wanted to give back, and I wanted to be connected. As time went on, I grew more confident that I was going to be around for a while! Plus, being informed gives me confidence to speak out on behalf of others who may not be as lucky as I was. When I see women who are in the midst of chemo, or fighting for their lives, I think, they are the brave ones. Tell us about your experience speaking to legislators on the Hill. I do it every year. At first it was daunting, but as time went on, I realized I’ve become somewhat of a mentor to people who are new to the cause. Recently, my husband came with me and we were paired up with a woman from Maine who had never spoken to legislators before. Her sister passed away at a young age, so we held her hand through the process, and told her what to expect when she went to meet with her representatives. It empowered her, and she really appreciated the help. Since I live in New Hampshire, a small state, I either know my politicians personally or I see them in my community. Being involved as an advocate is so rewarding and not at all uncomfortable any more. Everyone should go to Washington DC and participate in advocacy about something they care about at least once. The great thing about OCRFA is that there will be people there to guide you through the process–you don’t have to navigate it alone. Did you have prior advocacy experience? None. I’m not comfortable with public speaking, but I worked hard to remember facts and figures. I was nervous at the beginning, but now it doesn’t faze me in the least. It was a good experience for me personally, because it allowed me to get out of my comfort zone and taught me a new skill, and, of course, it’s also good for the cause. I pay a lot more attention to politics now than I used to. Some of the politicians, or members of their staff, remember my name year to year. Other offices are disorganized, and staff members don’t always show up for meetings, but I learn something when that happens, too. For example, I had a relationship with a fiscally conservative senator who generally wouldn’t vote to fund my requests, but she would always make time to talk to me personally. She was a key sponsor for ovarian cancer awareness month in September, and she was always willing to participate in awareness events. She shared with me that her grandmother died of ovarian cancer, and that’s why she found other ways to help. While I didn’t vote for her, I truly liked her as a person. Unfortunately, politics are still political, but making those little inroads may make a difference someday. Outside of OCRA’s Advocacy Days, do you participate in any other ovarian cancer advocacy efforts? I was on a Congressional Review Committee for funding on research programs, and I’d like to continue to do more of that. This one was done online, with me and one other patient advocate. It was very intense. I had to read complex abstracts and give my perspective about whether it was something reasonable from a patient perspective. Although it was a lot of work, I’ve applied to do it again. Every month, I go to my local hospital’s support group for gynecologic cancers. Mostly, I attend these meetings to be the support for recently diagnosed women. When I was diagnosed more than a decade ago, there weren’t too many options for support or advocacy. Now, I use social media, and participate in online groups. These things are especially important for women who may not be able to travel. Is there a particular policy issue that resonates with you and if so, why, and what action do you take? When I started doing advocacy work, New Hampshire was a purple state. Now, we have an all female delegation, so this conversation is something they’re interested in simply because they are women. The Ovarian Cancer Research Program through the Department of Defense (DoD) funding is very important, as is the oral parity issue (New Hampshire has passed a law that oral chemotherapy will be covered universally, but not all states have). I also participate with our local New Hampshire Cancer Coalition, but they focus more on prevention rather than advocacy. Even so, it does keep me in the know of what’s going on in the state and across the country. Issues like healthcare and insurance are important to me. I was fortunate to have had excellent insurance at the time of my diagnosis that allowed me to go to Dana Farber and not have to worry about the bills, but that’s not always the case. What would you tell somebody who is thinking about becoming an OCRFA Advocate Leader? Just do it. You’ve got nothing to lose and so much to gain. I don’t know anyone who hasn’t enjoyed their role as Advocate Leader. It’s a great education and it’s very empowering. OCRA has such dedicated people who do so much with limited resources, and I feel honored to be in the presence of these people. Our actions do make a difference.